Since 2016, I have presented in front of a number of different audiences to report about my hydrogen trips across Europe. 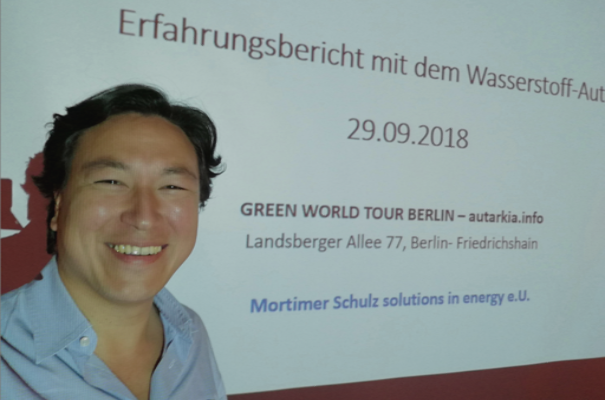 This year in September, I was invited to speak at the Green World Tour fair and I addressed the hydrogen cars that I drove, talked about the range with a full hydrogen tank and gave a short overview of the hydrogen refuelling infrastructure in Germany. The questions were interesting. On Saturday afternoon, I spoke at the SEZ sports centre in Landsberger Allee, Berlin, and began my talk with a few questions. Half the audience already sat in electric cars, and one person even sat in a fuel cell-electric vehicle already. I asked the audience to ask questions during my presentation to keep the discussion going and learn from each other. I presented just six slides including cover and coordinates. Since 2015, I have driven approx. 18,000 km (11,000 mi). The most mileage was done in the Hyundai ix35/Tucson FCEV. The Honda Clarity FCX, Honda Clarity FCV, the Toyota Mirai and Hyundai Nexo, I only tested on short distances. 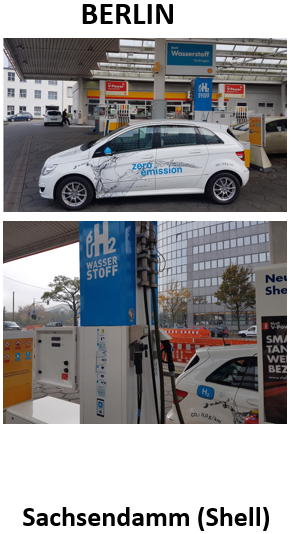 The Mercedes B-Class F-Cell though, I refuelled in South Berlin in October 2017 at the Shell Sachsendamm station, near EUREF-Campus; which is one of five hydrogen stations in Berlin. The map lists the 19 public hydrogen refuelling stations I have refuelled FCEVs at so far. 1x in Norway, 1x in Denmark, 1x in The Netherlands, 11x in Germany, 5x in Austria, and one further station in Austria on the grounds of TU Graz and one in Slovenia at the gas utility company. When I was travelling in 2016, there were 20 stations in Germany and now there are 50. According to H2 Mobility, it may be more than 70 this year. 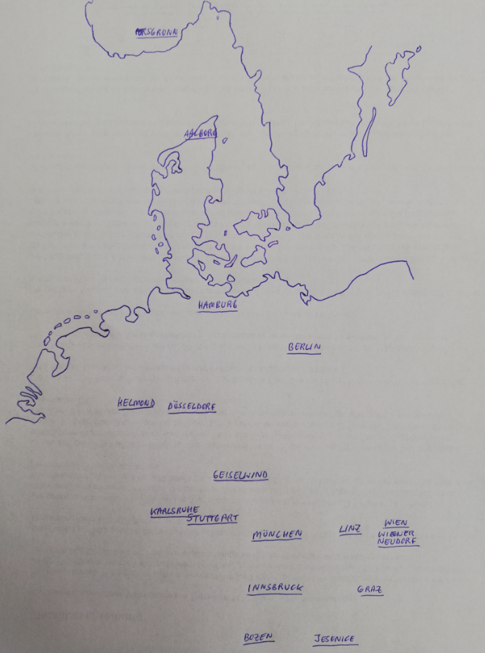 Furthermore, a total count of 400 stations is planned until 2023 or maybe 2025. I do hope to test many more refuelling stations in the coming months and years, and test many hydrogen cars; especially on long distances. Furthermore, I also sat in hydrogen-powered buses in London, Hamburg and Bolzano so far. In the middle picture above, I had proven that the Hyundai ix35/Tucson FCEV could be driven from Innsbruck to Vienna (296 mi) with one full tank; I drove at 100 km/h (62 mph) on the motorway. Upon arrival, I still had 72 km (44 mi) remaining range left. From Munich to Innsbruck, however, I drove at full speed on the German Autobahn, and it cost me half the tank. One advantage of driving hydrogen is the range. My furthest range in a Hyundai ix35/Tucson FCEV was 540 km (335 mi). In comparison, my shortest range with the same type of car was 320 km (200 mi). It depends on driving profiles, such as the acceleration, the braking and elevations to a certain extent. At least I know that 400 km (248 mi) is a good-working average for me. The new Hyundai Nexo, the Toyota Mirai, the Honda Clarity have a longer range, and so does the Mercedes GLC-Class F-Cell, which can even be plugged-in. Rather than quoting any numbers from the press, I need to try these cars myself, as I have already done, and reported about it, and continue to do so. Furthermore, refuelling takes 3-5 minutes only. When I drove from Innsbruck to Amsterdam, I refuelled four times; just to be on the safe side. It is great when you know what the audience wants to hear; and my message is “try it out”. One person asked where such cars could be tested. I was quite intrigued by the questions about the efficiency of hydrogen as alternative, the lifetime of a fuel cell, and green hydrogen. I showed the picture (below) to explain that the orange cables behind the fuel cell mean high voltage. While a gas such as hydrogen under pressure is explosive of course, the bigger risk for me is the high voltage in an electric car. When I asked the audience, whether they found batteries not to be dangerous, and petrol/diesel not to be dangerous, nobody raised their hand; obviously. The day before the presentation, I had visited the EUREF-Campus and passed by the Shell station where I refuelled the B-Class a year before. 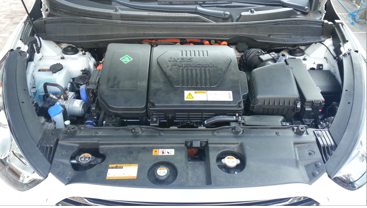 The picture above shows the hydrogen storage and compressor. Also, I mentioned that I had refuelled there and showed the pictures (below), with the Mercedes B-Class F-Cell (built in 2009). In conclusion, the audience was open towards the hydrogen topic, and, as visitors to a sustainability fair, they already had tried similar things as well. Hydrogen awareness has become stronger. For a copy of the presentation, do not hesitate to contact me.